Cindy has found the PINK version of this dog. Help! 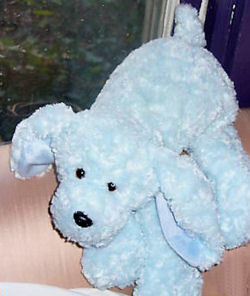 I am looking for a Pink (almost mauve) Microplush Floppy Puppy sold at ToysRUs in 2004. It is an Animal Alley item and is extremely soft, and I believe it has a satin collar around its neck. My daughter has lost her beloved “Pink Puppy” and cries often. I’ve searched the house top to bottom over and over, but Pink Puppy hasn’t shown up. I’ve hunted online for months and am looking for any help you can provide. Thank you for your site. When my son, Ryan, was ~6 months old, he became attached to his Monkey, and I immediately ordered two extras. He’s almost nine, and I just told him about the doubles! Ryan brought the dog to the hospital when Chloe was born, and it means the world to her/ us, but by the time Chloe expressed a clear preference for “Pink Puppy,” I couldn’t find an extra. Thank you for your help. I’ll keep checking your site to see if we might have someone else’s “lovey” on one of our shelves! Hi! Where did you get the dog in your picture. This is what I am looking for. My girl lost her dog a few months ago and until now she’s still crying for it. The toy has been with her since birth. You need to contact us, so we can help you find the blue version of this dog. For Anonymous, I believe I’d found the blue dog on ebay. I’ll keep my eye out for it. For Tami, thanks so much–it’s close but not the right dog. It’s a Gund and the one we need is Animal Alley. Thanks for keeping your eyes out! I really, really appreciate it!! !